Over the next few posts I’ll be highlighting how to run Windows Server 2016, Storage Spaces Direct (S2D) nested within a VMware vSphere environment. Storage Spaces Direct, Microsoft’s hyper-converged offering is a portion of the Windows Server 2016 offering. This post highlights process of enabling Hyper-V when WS2016 is deployed in the Guest VM. 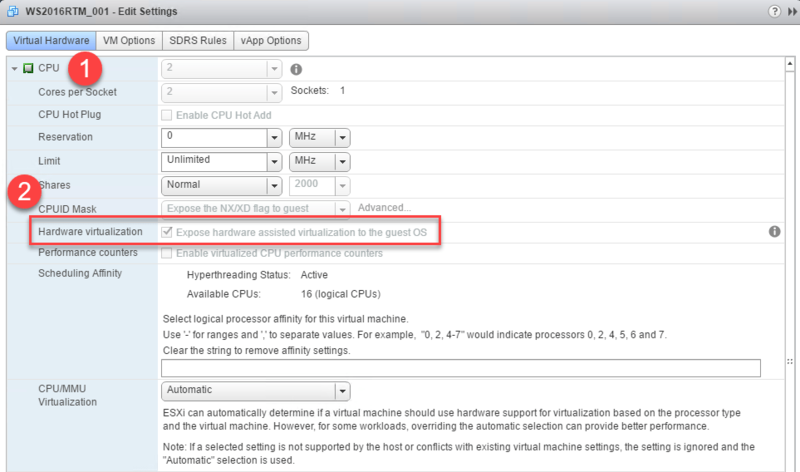 Now first, the topic of nested virtualization is very common inside of lab environments. Nested virtualization offers many benefits like testing out different features, functionality and offers a great way of seeing how things work. 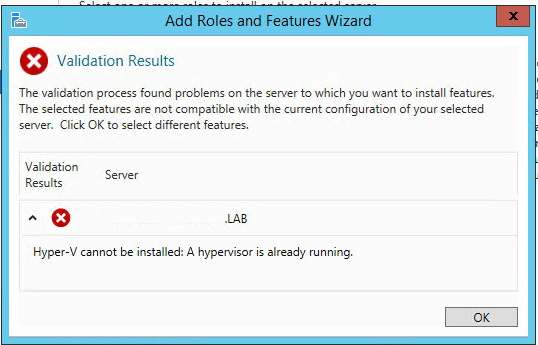 In fact Windows Server 2016 Hyper-v now allows you to deploy Hyper-V / vSphere inside of Hyper-V and it’s supported! So, I have actually started deploying labs locally on my Windows 10 laptop with the Hyper-V role enabled. This works out really well because many of the shows etc, that I present at regularly have horrible internet connections. Having the labs locally makes things run a lot smoother and no longer be at the mercy of the shows internet connection. For this lab I will be using production quality servers and NOT my Windows 10 laptop 🙂 In my lab environment I have 3 x Dell R630 Servers running vSphere 6.0.0.3620759 where each of my hosts have 32GB RAM. Its a decent setup, that allows me to do much of what I need to do for my day job. If you’ve ever tried to enable the Hyper-V role inside of a Windows Guest VM within you’ve likely seen this error message. Q: So how do we fix this? A.: Great question! It’s quite simple actually. As you likely recall and can find this well documented, in previous versions of vSphere and Windows Server you had to use the C# client, edit the settings of the VM you wish to enable Hyper-V on and then mess around with the CPU settings and then manually edit the .VMX file to update the Windows OS Version. Well, no harming of any VMX files was done in the making of this post. The pre-requisite of this is to download the Windows Server 2016 Media off of either MSDN or the TechNet Evaluation Center. That is all, we’ll need 4 of these VMs for our S2D Deployment so get busy!